Jonathan here -- Carrie's husband -- reviewing a book written for, well, husbands. I recognize husbands make up a severe minority in readership of this blog, so the rest of y'all will just have to bear with me. This title is a follow-up to Witmer's earlier book directed at elders and pastors, The Shepherd Leader: Achieving Effective Shepherding in Your Church , which I've heard good things about but not read personally. Both titles approach the subject of Christ in the role of shepherd, emphasizing lessons that we, as leaders in the home or the church, can apply to our own conduct and relationships. The Shepherd Knows His Family. This emphasizes the generous way Jesus spent his time in the presence of his disciples and others, building close, trusting relationships. Obviously, this was necessary for the disciples as they learned to be imitators of Christ. In addition to sacrificing his time spent with them, Jesus also frequently turned the conversation to issues of spiritual significance, rather than just maintaining surface-level friendships. This is a quality that we husbands can, and should, develop in relationships within our own families. He leads be beside still waters. Witmer does a good job identifying what Christlike leadership should look like (compared to the "Clean up your room!" commands of a drill sergeant, and the equally ineffective desperate pleas of a father who's lost any semblance of influence over his family). The Shepherd Provides For His Family. In this (the shortest section, at about 20 pages) we are exhorted to give our families a balance of "material provision" and "spiritual provision". Many temptations seek to turn our attention as fathers solely to one of these types of provision, at the expense of the other. Both are necessary for the well-being of a family. The Shepherd Protects His Family. In this, Witmer considers the issues confronting our families in the context of today's culture that rages against God in almost every way, and seeks to identify what steps we can take to protect our marriage and children from being led astray. This area of responsibility is one that has seen much neglect in the Christian church, and the book gives a clarion call to fathers to show love by exercising protection over their families, publicly and privately. 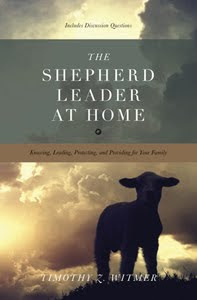 The Shepherd Leader at Home is a quick read, at about 150 pages, and it's more down-to-earth and conversational in style than an academic treatment of the role of fathers like what you might find in more theological literature. Still, I found it to have some helpful reminders, and will probably come back and re-read it occasionally as my own family dynamics change over time. Thanks, Crossway Books, for sending a copy to me in exchange for my honest thoughts. Looks like a good resource and maybe a good wedding or new baby gift.